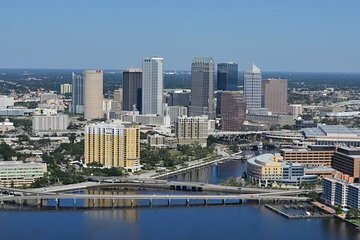 Experience the beauty of downtown Tampa Bay from the air on this guided helicopter tour. Fly above the city’s skyscrapers to get a bird’s-eye view of the biggest and best attractions, like the Florida Aquarium, the University of Tampa and Amalie Arena, to name a few. See the many waterfront mansions on the Davis Islands and then hover over the Port of Tampa and Hillsborough Bay to see if any bottlenose dolphins are visible in the water. It’s a sight for scenic eyes — an unforgettable view of everything Tampa Bay. This helicopter tour around and over Tampa Bay begins at the Peter O. Knight Airport on the Davis Islands, five minutes from downtown Tampa. Take off to the west of the city and enjoy a view of the most elaborate homes on the islands, including Bayshore Boulevard, as the helicopter turns north towards Tampa’s downtown skyline. Check out magnificent views from just above rooftop level. There’s Amalie Arena, home for ice hockey, basketball, arena football games and concerts; the Florida Aquarium, one of the top aquariums in the country; the University of Tampa and all the city’s skyscrapers — like Bank of America Plaza, 100 North Tampa and One Tampa City Center. Finish the flight by descending and hovering over the Port of Tampa and Hillsborough Bay to see if any bottlenose dolphins are visible playing in the water. Then it’s back to the Peter O. Knight Airport to conclude this unique and unforgettable tour of Tampa Bay.